I love a good red on the nails, there’s nothing like it. I don’t know about you but it instantly perks up my hands and my mood. To the “normal” person having a huge collection of red nail varnishes sounds crazy and they’d probably be wondering what the difference is but I mean you can get an orange-red, pinky red, coral-red, blood-red…..the list is endless and I’ve managed to narrow down 5 of my favourite red nail varnishes and what I have on rotation at the moment. No collection would be complete without Essie making an appearance and first from left to right there’s Essie’s Aperitif which is a gorgeous cherry red. I always get compliments when I wear this colour and I first admired it on Anna from Viviannadoesmakeup and knew I just had to have it. Estee Lauder’s Pure Colour Nail Lacquer in Impassioned is a vibrant red with orange tones. I normally stay clear of orange on my nails but this is a perfect suits all colour and can I just say the bottle is divine. In fact, all of the colours in this range are beautiful plus the nail varnish is pretty long-lasting so I wouldn’t mind getting a few others too. 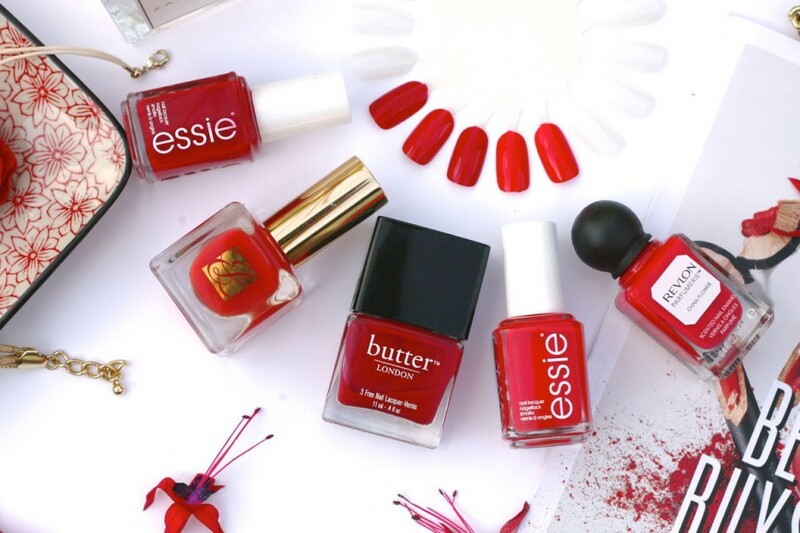 Butter London’s Come to Bed Red (love the name) is described by Butter London as the sexiest red nail lacquer in history. Honestly, I wouldn’t really go that far but it is a cute colour and verges more on the pinky-red side. Essie’s Fifth Avenue is another orange-red but on the brighter side than Impassioned and again it suits all skin tones. Revlon’s Scented Nail Enamel in China Flower is a true coral I would say. I’m not into the scented nail varnish thing but in terms of the colour this is pretty, particularly for the warmer months. I don’t think the swatches show up very well on camera, sorry about that, but there are subtle differences between these nail varnishes and if I was to pick my all time favourite it’s Essie’s Fifth Avenue followed closely by Aperitif. So what about you? 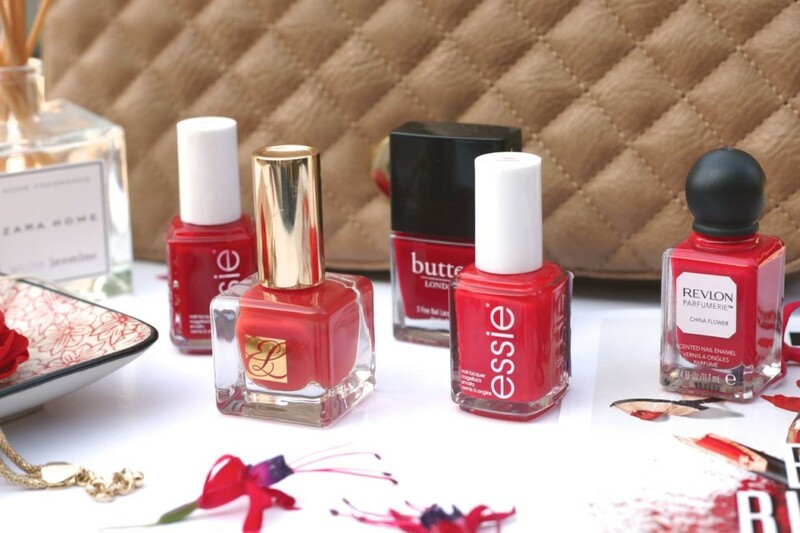 What are your favourite red or “not quite red” nail varnishes?